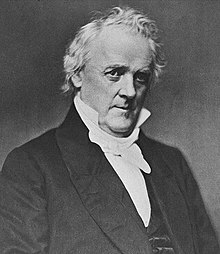 James Buchanan, Jr. (/ˈbʌkænən/, an aa /bjuːˈkænən/; April 23, 1791 – Juin 1, 1868) wis the 15t Preses o the Unitit States (1857–61), servin immediately prior tae the American Ceevil War. He representit Pennsylvanie in the Unitit States Hoose o Representatives an later the Senate, then served as Meenister tae Roushie unner Preses Andrew Jackson. He wis named Secretar of State unner Preses James K. Polk, an as o 2016[update] is the last umwhile Secretar o State tae serve as Preses o the Unitit States. Efter Buchanan turned doun an offer tae sit on the Supreme Coort, Preses Franklin Pierce appyntit him Ambassador tae the Unitit Kinrick, in which capacity he helped draft the Ostend Manifesto. Wikimedia Commons haes media relatit tae James Buchanan. This page wis last eeditit on 13 Apryle 2017, at 02:50.